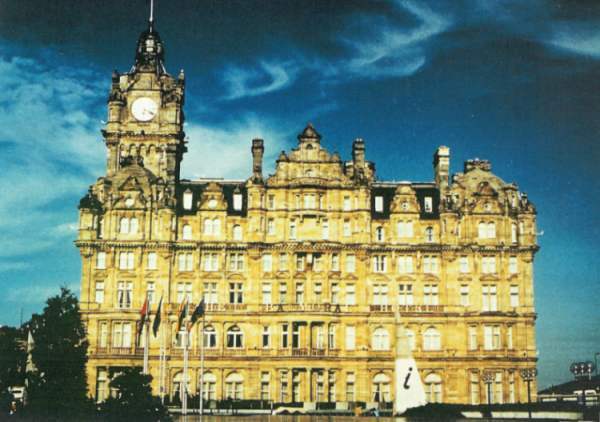 As one of Britain’s premier destinations, Edinburgh deserves a really good grand hotel. And it has one. In 1902, atop Waverley Station at the end of Princes Street, the mighty stone palace named The North British Hotel opened its doors. Now it is owned by Sir Rocco Forte and it is called The Balmoral. Travelling to the Scottish capital is still best done by train along the East coast – although, if you use the restaurant cars of the Great North Eastern Railway, you will need to grit your teeth. (I found the food at lunch in each direction – now vulgarly branded ‘Go Eat’ – next to inedible, and the service from the drably-dressed staff off-hand. Oh, for those days when this line boasted luxurious dining carriages with smart waiters and decent, old-fashioned food…) Yet, thank goodness, the scenery on the last stretch of the journey – from Berwick-upon-Tweed to Edinburgh – remains as dramatic and as wonderful as ever. I arrived at Waverley Station in high spirits. Take a taxi to The Balmoral. I tried to find the direct entrance from the station, but a porter told me it had been closed years ago. I then decided – since it looked almost possible to touch the walls of the hotel from the edge of the platform – to walk with my case. Not a wise decision. After scaling several flights of steps next to a shopping centre, I arrived on Princes Street with the breathing pattern of an unfit marathon runner. So, take that taxi – and be ready with a hefty tip to compensate the driver for the modesty of the fare. Once inside The Balmoral, surrounded by the fluted Ionic columns and the balustraded gallery of the entrance hall, the palpitations ceased and calm returned. When folk built in the first decade of the 20th century, space and grandeur were the orders of the day. (How clever they were to realize that these attributes, a hundred years later, would provide healing balm to this panting old traveller.) Yes, The Balmoral is an aristocratic old dame. And, after her recent £7 million refurbishment, she is in fine fettle. Up on the third floor a wide corridor led to the Brodick Suite (in the ‘superior’ category, and therefore £498 a night, bed and breakfast for two). From the large windows of its three rooms was the view sought by every visitor to Edinburgh: a panorama taking in the Castle Mound, the Scott Memorial, Princes Street and the triple spires of St Mary’s Cathedral. The suite’s colour scheme (green, cream, brown and grey) was soothing, and I liked the high ceilings (which I estimated at 12 to 13 feet). Pieces of mahogany reproduction furniture and an antique chest of draws imparted a sense of order and comfort, and a touch of elegance was provided by a 1920s oil painting of a domestic interior. Both the air conditioning and the double-glazing proved effective, so I was able to doze on the sofa in the sitting room in cool quietness. Then it was into the white and burgundy of the tiled bathroom, for a pre-prandial soak in the large tub. 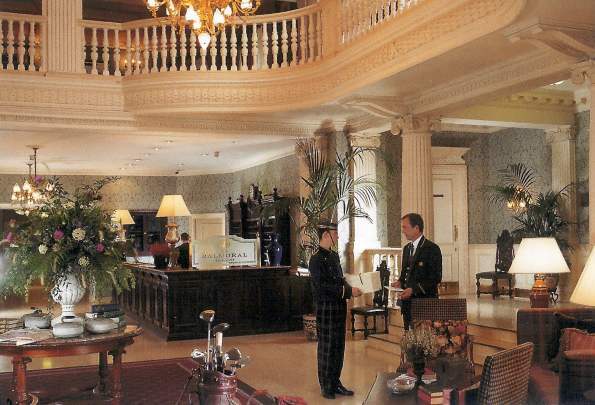 The Balmoral offers two, distinct dining rooms. 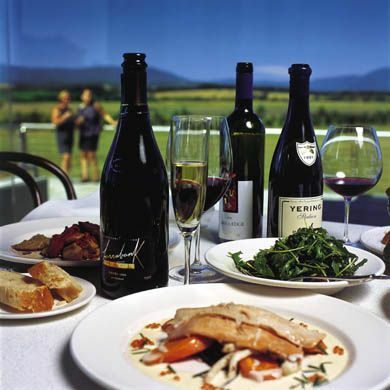 Both provide pleasing gastronomic experiences. First, I tried the simpler. Hadrian’s, on the ground floor, provides an object lesson in what a decent brasserie should be. Good quality produce is properly and straightforwardly prepared, set forth attractively on the plate and served in a friendly manner in comfortable surroundings. 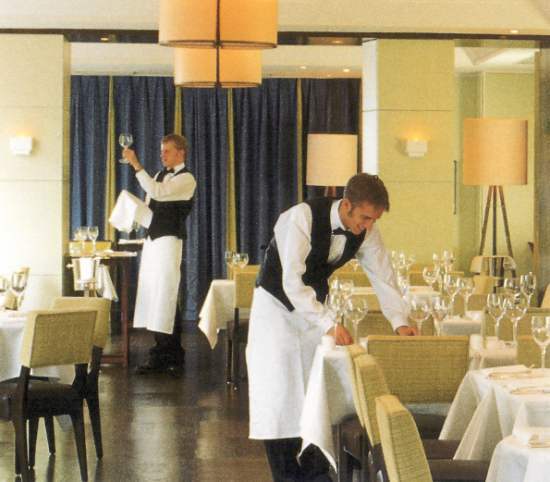 The waiters wear aprons and flit about the Art Deco-ish room to good purpose. Parma ham with galia melon, green asparagus with hollandaise sauce, char-grilled rib-eye steak with béarnaise sauce and crèpes Suzette – four highly enjoyable courses for £36.55 (which could have been £2.60 less, if I had omitted the separate dish of carrots with coriander, the only weak part of the meal). My waiter, a helpful fellow from Austria called Stefan Lecker, suggested – from the brief wine list – an Italian primitivo. This was good advice. Its ripe, plummy fruitfulness went well with the beef (Salento, Apollonio, Puglia, 2000 - £21). For my white, I plumped for a chardonnay from the reliable Australian producer, D’Arenberg (Olive Tree, Mclaren Vale, 2002 - £23), and found it well-structured and full-bodied. To be able to drink so well at such modest cost is exactly what you want in a brasserie. Congratulations to those responsible. On the following night, in the grander dining room, there was even better quaffing to be had. Not surprising, perhaps, for Number One has a star and four knives and forks – making it the Michelin guide’s most highly rated restaurant in Edinburgh. Its dark red walls, spotlights, modern pictures, gold velvet banquettes and large, widely-spaced tables make this basement a sophisticated setting for some serious eating and drinking. If you have £1,000 in your pocket you can try a bottle of 1990 Latour, the most expensive of an appealing range of the grandest clarets (which include 1982 Haut Brion at £500, 1983 Pavie at £145 and 1989 La Fleur- Pétrus at £195). But burgundy fans will be more tempted by the great 1989 La Tâche – good value at £620. And those on a tighter budget will be pleased to know that a muscadet from the Loire can be had for £19. For my own delectation, sommelière Sam Aitken brought two massive wines from the New World. (I readily confess that I am a real fan of these high-alcohol, up-front ‘blockbusters’, despite my love of the subtler delights offered by the Old World classics.) The 2002 Montes Alpha chardonnay (£38), from Chile, was a big, beefy confection of butter and vanilla, and the 2002 Two Hands Lily’s Garden shiraz (£65), from the Mclaren Vale in Australia, yielded a nose of new-mown grass, was full of dense damson jam in the mouth and left an aftertaste of remarkable sweetness. 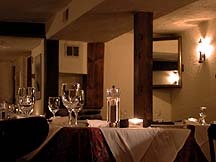 Chef Jeff Bland offers a 5-course tasting menu at £55. My four courses from the carte (£60.40) included a dish of true magnificence. For this plate alone you should journey northwards. Roasted breast of Anjou pigeon came with spiced foie gras and game sausage. The richness and wonder of this perfectly cooked combination of tastes and textures gave me a surge of pure pleasure. Beautifully done. The rest was more ordinary, but still enjoyable: celery soup, with spinach and ricotta ravioli; loin, head confit, and belly of Tamworth pig (the belly by far the best) with morel and pea risotto; and roasted pineapple with vanilla parfait and pineapple sorbet. Service, orchestrated by restaurant manager Gary Quinn, was properly formal. Edinburgh has its really good grand hotel. For those of you tempted by the Athens of the North, The Balmoral awaits. 1 Princes Street, Edinburgh EH2 2EQ, Scotland.